Description: Erect, usually bushy shrub or tree 2–10 m high, mostly single-stemmed; bark finely fissured, brownish; branchlets angled or terete, usually glabrous. 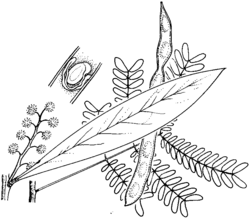 Bipinnate leaves mostly present on mature plants; rachis 4–8 cm long, with 3 or 4 pairs of pinnae, jugary and interjugary glands absent; pinnae 4–7 cm long, each with 9–14 pairs of pinnules; pinnules oblong-elliptic, 8–14 mm long, 2–4 mm wide. Phyllodes narrowly elliptic to oblanceolate, straight or subfalcate, 5–20 cm long, 8–25 mm wide, subglaucous, often reddish, glabrous, midvein prominent and ± towards upper margin, lateral veins sometimes distinct, margins prominent, apex acute to obtuse with a mucro; 1 gland 5–40 mm above pulvinus, rarely a second gland along margin; pulvinus 1–5 mm long. Inflorescences 5–29 in an axillary raceme; axis 1–10 cm long; peduncles 2–6 mm long, minutely appressed-hairy to glabrous; heads globose, 9–15-flowered, 5–7 mm diam., pale to bright yellow. Pods ± straight, ± flat, ± straight-sided but often constricted between some seeds, 4–12 cm long, 6–9 mm wide, firmly papery to thinly leathery, glabrous, often ± pruinose; seeds longitudinal; funicle almost or completely encircling seed. Distribution and occurrence: east from Wagga. Usually grows in dry sclerophyll forest and woodland, on elevated rocky sites, also invasive along roadside verges. The name refers to the usually reddish colour of the phyllodes, especially noticeable on drying. A very variable species with mostly straight somewhat reddish phyllodes but some plants from the south of Lake George on the Southern Tablelands have falcate and slightly glaucous phyllodes. There are also differences in the juvenile bipinate leaves. Related to A. nana.